Anne Hallee of Rising Up Farm on Route 52 stands with her eight-year-old daughter, Avaline Fairhayden, in front of a line of trees that would be affected if the city of Belfast clears vegetation to facilitate airspace safety near the Belfast Municipal Airport. BELFAST, Maine — Belfast city officials and some city residents are finding they don’t see eye to eye regarding the fate of some trees near the Belfast Municipal Airport. City officials maintain that some of the taller trees will need to be cut down in order to meet Federal Aviation Administration airspace safety requirements. But a vocal group of residents says it believes the city may be exaggerating the FAA’s requirements. They think Belfast officials are prioritizing the airport, and the businesses that use it, over the well-being of other residents. 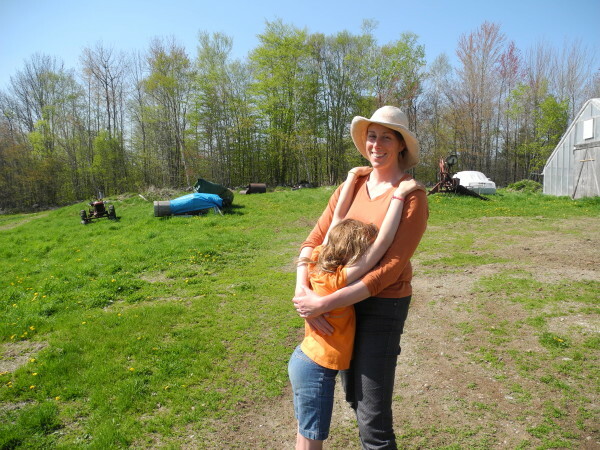 “We have to look at the broad picture and look at a community planning perspective,” said Anne Hallee of Rising Up Farm on Route 52, a property that is likely to lose some of its trees. She said that the trees provide a critical buffer for pesticide drift and water runoff, and that their loss will hurt her organic farm — possibly even causing it to lose its organic certification. But Thomas Kittredge, Belfast economic development director and airport manager, said he thinks a solution can be found that will not require the city to choose between airport safety and the desires of affected residents and businesses. “I’m hopeful the city can work out a solution with every individual property owner that will leave them satisfied at the end of the day and meet the airport’s needs, too,” he said. The Belfast Municipal Airport was established in the 1940s, and it boasts a 4,000-foot runway and 24 privately owned hangars. It’s busier in the summertime, although athenahealth’s growth in Belfast has led to more year-round use, as company executives often fly into and out of the municipal airport. Three years ago, the FAA surveyed the airport and found obstructions that would affect flights during times of low visibility, Kittredge said. In dealing with that emergency, city officials realized that they had a bigger problem looming on the horizon — lots of trees in the airspace that had grown tall enough to potentially be a problem. Belfast has an agreement with the FAA that the city will deal with obstructions. This spring, City Manager Joe Slocum sent a letter to affected people to explain that the FAA notified Belfast that the city needs to address the obstructions. In the letter, he told abutters that the city was talking about cutting trees down and not about trimming them shorter every year. Slocum said that Belfast’s goal was to be “forthright, upfront and to negotiate in good faith” with private property owners, but if somebody refused to sell an easement to the city at any cost, the city would have to consider the dramatic remedy of eminent domain. In March, the city heard an earful from abutters and other residents who love trees during a public presentation about the airport obstructions. The 30 or so people present spent nearly three hours sharing their thoughts about the proposed tree removal with city officials. Most were sharply opposed. “It’s a question of, ‘Gee, is there an end to this?’” Morten Moesswilde, a forester who has lived near the airport for a dozen years and isn’t a fan of what he described as its slow expansion, said this week. But Kittredge doesn’t see the tree removal as something that will be a disaster for Belfast. He said that in general, obstructions will need to be cut down because trimming the trees is not a long-term solution. Certain trees do not react well to trimming, he said. But if the city needs to remove trees, in some instances it will pay to replant different, shorter species of trees in the same location. He hopes the city will start discussing easements with landowners this fall, and he expects the process to last for a year or so. Belfast has submitted an application to the Maine Department of Environmental Protection for a permit to do the work. Hallee, the farmer, said that she hopes that a solution can be found that will not require all her tall trees to be cut down. When she and her family purchased the farm several years ago, they knew the city had an airspace easement on the property. They met with city officials and an athenahealth pilot to figure out what the easement might mean to them in the future.